Calibrate StyleShoots regularly to ensure that it gives you the best results possible. StyleShoots can automatically calibrate white balance and backlight intensity. You should calibrate the system whenever the surrounding light conditions change. Place the gray card within the centrally marked area. Vertical only: Place the gray card on the fixture extender to get it centered. Tap calibrate and stay clear of the table. Remove the gray card from the table. Make sure the backlight is completely cleared of any objects. Vertical only: Undock the Caddy so nothing is covering the backlight. Tap I've cleared the backlight completely if you indeed have. When calibration is done, you can continue working. Workflow offers options for you to achieve the fastest workflow possible by using smart features such as Auto Naming and Auto Export. With Auto Naming enabled, StyleShoots automatically picks a name for your photos and skips the Name screen entirely and immediately returns you to Live View when you've taken a photo. To turn Auto Naming on or off, tap the toggle-switch. With Auto Naming enabled, you can photograph as fast as you can put the products on the table. Tip: You can always change the auto-generated names later by going to Photos, tapping the image and tapping Edit. So you can use Auto Naming to quickly photograph a batch of products, and then deal with the naming later. With Auto Export enabled, StyleShoots automatically exports your photos as soon as they are taken. 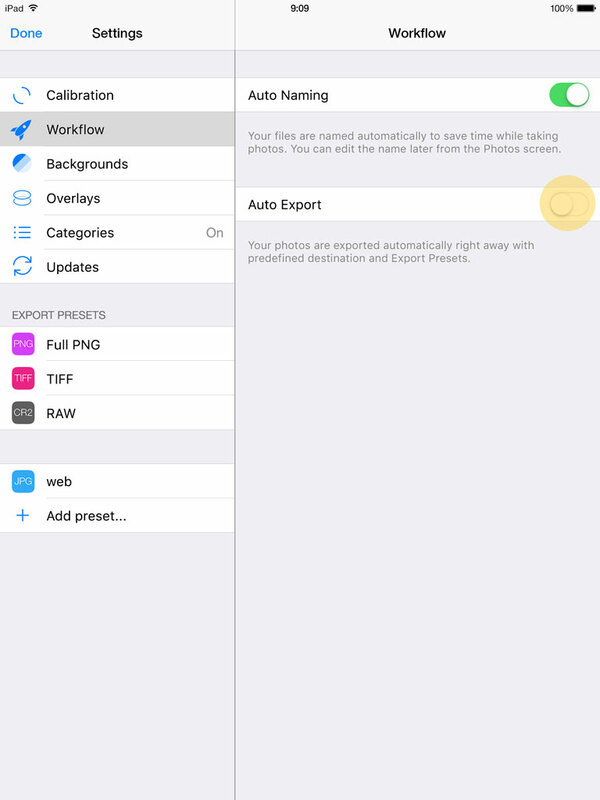 You trade in the ability to review your photos from the Photos screen, but you gain speed in workflow. To turn Auto Export on or off, tap the toggle-switch. Tap Save. Once activated, any pending photos in the Photos screen will automatically be exported. Whenever you have taken a photo and tap Export, the processed files will automatically be saved to your predefined destination. If the predefined storage destination becomes unavailable or full, Auto Export is automatically disabled, and your files will be kept in the Photos screen, where you can export them manually. You can always go back to Settings and re-enable Auto Export once you have ensured a usable destination is available. Backgrounds is where you manage the images available as backgrounds for your Export Presets. Tap Backgrounds to view the files stored inside StyleShoots. Tap a background to view it full screen. Tap a background to open it. You won’t be able to delete a background if it is already in use in an Export Preset. Overlays can help you keep your styling consistent. If you’re shooting several pairs of jeans, you can use a photo of the first pair as a reference to be displayed on top of your Live View. When you arrange the following pairs, you can position them all in the exact same way. You can turn any image currently in Photos into an Overlay. See how here. Tap a thumbnail to open it. Tap on the trashcan icon. Categories are a helpful sorting tool when you take multiple photos of the same product. The category will be saved as part of the file name, making it easy to identify later. To turn Categories on or off, tap on the switch. If you turn Categories off, the Category field will not show up in the Name screen. Name the new category and tap Done. Tap the Delete icon next to the category you want to remove. In edit mode, you can also change the order of categories. Drag the category to the desired spot. In the updates section you can install pending software updates, see your system version and review what each new update included. Version history provides an overview of what each software version added or changed. Tap any of the software releases to view details of what it included and when it was released. Pending updates are brought to your attention by a red badge on Settings in the Photos screen, and on the Updates button itself. Tap Updates to view pending updates. Tap each update to view it's contents and to install it. If the update is for the Core inside StyleShoots, the system will become unavailable for a moment while they system restarts. If the update is for the iPad app itself, you will be taken to the App Store to enable the download from there. StyleShoots comes with a number of predefined Export Presets. These presets cannot be deleted, but can be disabled during export. Full PNG: A full-resolution PNG file, cropped, rotated and with alpha transparency. TIFF: The Auto Alpha result in maximum lossless quality with the alpha transparency mask as an individual channel. RAW: The original Canon RAW file saved directly and untouched from the camera. You can add an infinite number of custom Export Presets. These can be edited or deleted again as needed. Name your preset and tap Done. If you ever want to change the name of your preset, you can edit it directly in the Name field. Choose a file type by taping on PNG or JPG. PNG offers the best image quality and full transparency, but the files are larger. JPG can be reduced to smaller file sizes, but at the loss of quality and transparency. Save files in different dimensions depending on whether you need a thumbnail for web or a high resolution file for print. Tap on Width or Height and enter the desired pixel dimensions. To force all photos to have the same dimensions regardless of the contents' aspect ratio, turn Fixed Dimensions on. If Fixed Dimensions is off, your photos will be cropped to fit the aspect ratio of the product. If you have chosen JPG as your preset format, you can select the compression quality of your images. The scale goes from 1 to 10 where 10 is best quality and largest file size. JPG uses lossy compression, meaning the files size can get extremely small, but at the expense of quality. Quality setting 8 is a good compromise between quality and file size. If you have selected PNG as your file type, the quality is always going to be maximum. PNG uses lossless compression, meaning your files are as small as possible without throwing away any information. Tap the Show Shadow switch to turn it on. Determine angle, distance, size and opacity. For your background, you can select a color, apply an image from your stored background files, or leave it Transparent. Drag the sliders to set a custom solid color. Tap the numbers to directly type an RGB value. Select a photo by tapping the thumbnail. Make sure you select an image that has at least the same dimensions as your preset. If the image is not as large as the preset, it won't fill up the whole background of the exported file. Tap Transparent to keep the alpha transparent background of your photo. Only PNG supports alpha transparency. If you have chosen a JPG format for your preset, you will not be able to select a transparent background.